The Phoney War ended on the 10th May 1940, when 3 million German troops swept across France, Belgium and Holland. On the same day, Neville Chamberlain resigned and Winston Churchill became Prime Minister. 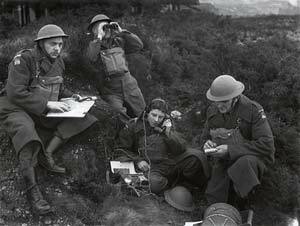 With 10 divisions of the BEF trapped at Dunkirk, the defence of Britain became a priority. On the 14th May, Anthony Eden broadcast to the nation, asking for fit men to volunteer to defend the country - the Local Defence Volunteers, later the Home Guard, was born. No 1 (A) Company - Pinhoe Road to the River Exe. No 2 (B) Company - Cowley Bridge to Pinhoe Road. No 3 (C) Company - St Thomas side of River Exe to Cowley Bridge. The LDV immediately started to patrol the city and set up observation posts. Enthusiasm was the byword, as the hastily commissioned units had no uniforms, no weapons to speak of, and little training. Many of the men were veterans from the First War, while some had served in the Boer War. There were also able bodied men who were serving in reserved occupations, or were too young to join the regular forces. During the first few weeks, the would be defenders of Exeter dressed in civilian clothes, manned the guard posts and patrolled the perimeter of the city. In June, the first of the ill-fitting, denim suits arrived. The stop gap suits were often far too large and needed to be taken in to fit. Improvised weapons were carried on patrol, supplemented with sixty rifles borrowed from the Exeter School OTC. In the aftermath of Dunkirk, invasion rumours were rife, and there was a sudden call to "Stand To." The three fledgling Companies were ordered to parade in Paul Street, await orders and for the guard posts and patrols to be on alert. Before the "All Clear" was given, one patrol reported seeing paratroops dropping on Hill Barton Road, and in the confusion, the Home Secretary was called out of bed, probably much to his annoyance. By July, the first of several consignments of United States made Pattern P17 rifles were delivered – the rifles were packed in grease, requiring hours of cleaning to prepare them for use. Firing practice was organised at Starcross Range by Major Row MC, who paid for the ammunition himself. The Civic Hall was used for Instructor Courses in the Browning Machine Gun. The first battledress was issued in July along with a quantity of boots. Training with real Mills grenades was not possible, so it was arranged to make some dummy, wooden grenades, no doubt with the thrower shouting 'bang' after the required four seconds. Homemade bombs were also produced, which were "very dangerous to the Hun" despite being "... a little bit dangerous to the users." On the 15th August 1940, the Prime Minister, Winston Churchill decreed that the name of the LDV be changed to Home Guard, a popular move amongst the men. The LDV armlets were quickly replaced with ones proclaiming Home Guard. All ranks were also allowed to wear the Badge of their County Regiment, and Exeter proudly bore the Devonshire badge with the motto 'Semper Fidelis.' The 21st of August was a sad day for the Detachment, for Major Anstey who had been in command from inception, died – he was replaced by Capt. F J C Hunter. More equipment was arriving, and at the end of August, the first steel helmets were issued; as there were so few, those going off duty had to return them for cleaning and re-issue the next evening. In early September No 4 (Mobile) Company was formed – in addition to transport supplied by the authorities, the men raised, over two years, enough money to purchase their own van, four motor cycle combinations, eight motor cycles and a field cooker. The new unit would be required to go anywhere in Devon and Cornwall in the event of an emergency. On Friday 7th September, the Battle of Britain was effectively won, when the German air force turned its attention towards bombing London and other cities. Exeter suffered four hit and run raids during September with the loss of four killed, while London lost 436 on the 7th alone. 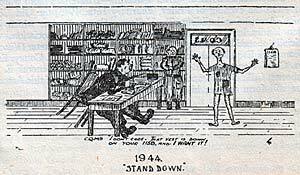 The whole country was on invasion alert, and on the same day, a national Stand To was ordered which would last 10 days. Observation posts were manned through the night, while road blocks were guarded. The Bonhay Road railway bridge still has holes in the brickwork that held the ironwork in place that blocked the road. 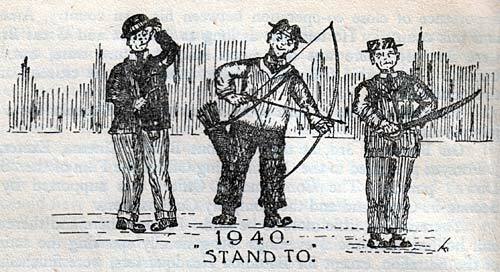 The Exeter Home Guard undertook their duties by night to be relieved by the regular army at 6am. A Home Guard volunteer had to provide his own rations which he would prepare at home and carry in his haversack. A standing joke at the time was that the Home Guard volunteers worked all day and then relieved the Regular Army so that their men could go to the pictures or take their girl friends out. 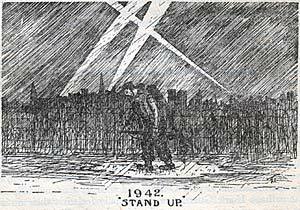 Stand Down was on the 17th September 1940 when it was judged that Hitler's invasion plans had been put on hold. During September, 797 rifles and 26,000 rounds of ammunition were delivered – one wonders if it would have been in time if the invasion had taken place. Tommy Greenslade, from Exwick, was one of the first to volunteer during the First World War. He was involved in the formation of the LDV from the start and on 27th September he was appointed Commander of No 3 (C) St Thomas Company. Also during September, the first serge battle dress was issued with nine pence allocated for each garment to be altered to fit, a service that was often needed. After the fears of invasion, in September, the Battalion settled into a program of training, exercises, parades and attending church. In October No 2 (B) Company, commanded by H J Wiltsher, attended church parade at St David's Church, in a service taken by the vicar of St David's, Rev. C E Burkitt, a member of the company. On Sunday the 10th November 1940 the Battalion held its first route march, ending at the Guildhall at 12 midday where the Mayor R Glave-Saunders gave the salute. The men wore their battle-dress, forage cap, leather belts with bayonet, scabbard, frog, rifle with sling, gas mask and black boots. It must have been difficult for those men who were over 50 years old, some of whom would have been the same age as the mythical Corporal Jones in Dad's Army. GWR Home Guard, who had responsibility for the railway, bridges and St David's Station, and was part of No 2 (B) Company were formed into an independent No 6 Company of 187 men. The personnel from No. 6 Company were all employees of the GWR and their Head Quarters were at St David's Station. There were also small factory units serving with the main Battalion including The Admiralty Platoon, The Civil Defence Platoon, The Fire Brigade Platoon, Devon County Council Platoon, Express and Echo Platoon, H M Prison Platoon, Research Department Platoon and the Records Department Platoon. There was no going home for dinner and feet up, listening to the wireless, after a hard days work, for many as a volunteer would be on guard duty all night, or at the least, attend training in a local church hall. At the end of 1940, attention turned towards the threat of bombing raids, and training was given in dealing with what was a new German weapon, the incendiary bomb, a bomb which all would become very familiar. Stand To - Britain under threat. 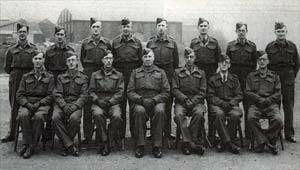 Officers of C Company (St Thomas). At the start of the new year, attention turned to creating a defensive ring around Exeter and work started on digging 14½ miles of trenches and laying barbed wire. Ten miles were dug by the Home Guard and the rest by the regulars. This was a task very familiar to the men of the Home Guard, men who had dug trenches during the First World War. It perhaps indicates how thinking had not changed for the old soldiers, and how the new, mobile blitzkrieg warfare of the Germans rendered such preparation superfluous. Some of the trenches became waterlogged and had to be emptied with pumps. The volunteers even turned out after it had snowed carrying their haversacks of food from home, supplemented with hot tea and soup supplied by the Company Commanders. The trench and wire defences crossed fields and ditches, while in some places the wire had to be movable so that farming could continue, or a fence built to prevent cattle from falling into the trench. A new weapon, the Northover Projector was introduced in June 1941. It was used to fire Molotov and AW bombs, both designed as anti-tank weapons. The standard Mills grenade could also be fired from the contraption, for that was what it was, as it used black powder to fire the projectile and a toy percussion cap to ignite it. It was only accurate up to 100 yards, if the projectile didn't explode in the tube. Other new weapons introduced in 1941 were the Spigot Mortar and the Sten Gun, which was prone to jamb. Ranges were set up for live firing these weapons in old quarries at the top of Haldon Hill. Exercises were held in and around Exeter to train the Battalion in defending the city. These 'war games' would often highlight weak spots in the defences and produce incidents which after 70 odd years, appear rather humorous. One such was when Exmouth Junction was defended by 'B' Company, 22nd (S.R.) Battalion, who were under attack from No 2 (B) Company. Many of the dead, remained alive, and many of the alive claimed many casualties from a single bullet – all ended well with tea for the troops, supplied by the Southern Railways. A large exercise was held in October to test the defences of Exeter – the whole of the Battalion was to defend the city, apart from No 2 (B) Company, who would take the part of the enemy attacking from the south and west. During the night, two members of the attackers dressed up as Special Constables and tricked their way past the defence, allowing them to feed information to their comrades. In another case, an officer and three others entered the city in civilian clothes, carrying billiard cases. They got through the outer defences, but three were stopped and detained. The remaining infiltrator almost reached Headquarters in Bedford Street were he was also arrested. He was taken in for interrogation and while waiting in the guard room he threw the billiard case on the floor claiming it was full of explosives and that he had destroyed Headquarters. The Umpire for the exercise ruled that the room was destroyed and that the prisoner had committed suicide. 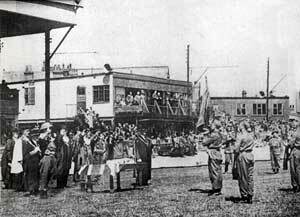 A large Military Tournament was held at St James Park on the 4th October 1941 when competitions were held in the route march, machine gun competition, gas race, grenade throwing competition, relay and last, the drill competition. A large crowd filled the stand to watch No 4 (Mobile) Company win the silver trophy. At the end of 1941 the Battalion had 1,740 men enlisted in its ranks. The number of men in the Home Guard was still below strength at the beginning of 1942, as many transferred to the regular forces. To keep the Battalion up to strength, conscription was introduced during March, and the Labour Exchange was instructed to direct men into the Battalion. 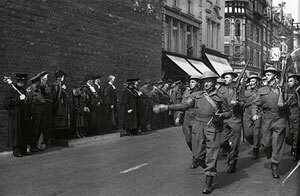 The 1st Battalion march past the Mayor at the bricked up Guildhall in 1941. The Signals Battalion on exercise. 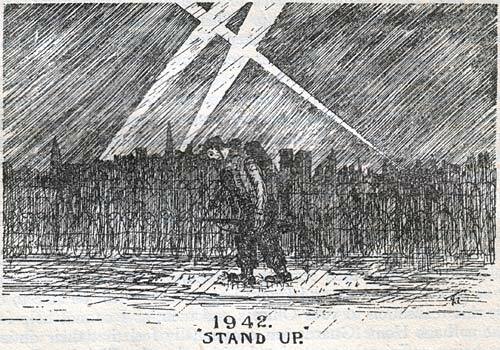 The air raids of 25th and 26th April saw the Home Guard help excavate damaged buildings around the city, and search for missing people. The blitz of the 4th May 1942 has been well covered on this site – suffice to say, the 1st Battalion played an important role, and sustained several casualties, including Lt. Col. F J C Hunter. After the sirens sounded, Lt. Col. Hunter was on fire watch at his home in West Avenue. He was outside his shelter when a high explosive bomb hit his house, seriously wounding him. He was carried to Wrentham Hall First Aid Section on a door. Lieutenant Rainbird who had assisted in carrying him said "... in spite of his injuries and the pain he was suffering, (he was) the bravest man I had met and was most cheerful throughout the short time that he was in the first aid station before being taken to hospital." He died two days later and was buried at Exmouth with Senior Officers as pall bearers. At the Battalion Headquarters in the Drill Hall, Bedford Circus, a direct hit killed three members of the Battalion, while three others died elsewhere in the city, while on duty and two while off duty. All the Battalion records held at the Headquarters in Bedford Circus plus much equipment was also lost. During the ninety minutes of the raid and in the hours following, members of the 1st Battalion undertook fire fighting, traffic control, furniture removal from damaged property, clearing debris from the streets, and of course, rescuing those trapped in the rubble. The Home Guard cleared Castle Street so that new batteries could be taken to the telephone exchange to get the phone system working again. However, ingenuity was found when the Quartermaster Sergeant W F H Payne announced that although he had tea, sugar and milk, there was no gas to boil the water. A volunteer stepped forward, who hung the kettle on the end of a long iron pole and stuck it through the doorway of a burning church, right into the flames. The kettle boiled in double quick time and soon the men were drinking a welcome cup of tea. In the last air raid on Exeter, on the 30th December 1942, two more members of Exeter's 1st Battalion were killed – they were the last to die in the Exeter blitz. See sidepanel for the Role of Honour. Training and military exercises resumed once the trauma of May 1942 passed – one Battalion exercise took place in September 1942 when it was arranged for 300 enemy to attack Exeter on a line between the Double Locks and Exwick Mills. Zero hour was 10.30 and 'Cease Fire' at 16.00. Of course it was arranged to have truce at 13.00 so that the men could eat their haversack rations. The main attack came through Ide, and in the few hours of the exercise, it was thought that many lessons were learnt. One has to wonder if the German Army would have stopped for lunch! Another exercise in October required the Battalion, supported by Marines to hold a line along the bypass from Pinhoe to Countess Wear. British aircraft undertook a dummy dive bombing raid on Exe Bridge, destroying it, and the Battalion had to divert all traffic over the Countess Wear Bridges. All this pretend mayhem gave the Battalion plenty of practice in diverting messages around the smashed bridge. The enemy managed to penetrate the city as far as Colleton Crescent and Quay Lane. Luckily a relief column entered the city via Stoke Hill and the Old Tiverton Road in armoured cars and jeeps. They then cleared the enemy from Sidwell Street, giving covering fire to attacking troops who had their mobile artillery with them. It was a close run thing! The Battalion even had the chance to see some training films at the Odeon Cinema. The cinema was also used by the Battalion for Church Parade, presumably because the Cathedral was undertaking repairs. In fact, the Odeon was also used for a Special Concert, when the Band of the Devonshire Regiment played a programme of music, raising £60 for the Battalion Commander's Fund. Stand Up - protecting the city. Sunday May 16th 1943 was a special day for the 1st (Loyal City of Exeter) Battalion, Devon Home Guard when the City Council presented a Flag to the Battalion. Permission was obtained from Gen. Sir Charles Maynard, Colonel of the Devonshire Regiment for the flag to bear the crest of the Devonshire Regiment. The ceremony took place at the County Ground when the flag was blessed by the padre the Rev Preb. E Reid MA, and then the Mayor R Glave Saunders presented the flag to the Commanding Officer, Lt Col. J W Western, who had first joined the 1st Rifle Volunteers in 1896. The event was filmed by British Gaumont News who quickly edited it for showing the next week at the Odeon. The film was then handed to Lt Col. H J Wiltsher, who by that time was the new Commanding Officer. It is not known if the film still exists. After the war the flag was hung in St Mary Arches Church. On the 22nd May there was a Service March Past through the High Street for the' Wings of Victory' Week – about 500 men of the Battalion, under the command of Major H J Wiltsher formed up in Pinhoe Road. The weather was wet, but the march past the Mayor at the Guildhall and across the Exe Bridge did much to improve morale in the city. The first decoration to a member of the Battalion was announced on the 30th June, when Lieut. Henry John Ferguson of No 1 (A) Company was awarded the Most Excellent Order of the British Empire. He has distinguished himself during the blitz when he was Orderly Officer at Battalion Headquarters. Exercises continued through 1943, and again, Exeter found itself under attack from the 'enemy', only for the 1st Battalion to drive them away. In October, a day was spent on Dartmoor in a big demonstration at the Warren House Range, to show the capability of the weapons at the disposal of the Battalion. There was a contingent of US Army officers to observe the war games. The event required four men to attack a building, using 36 live grenades, as a battle patrol, and the Battalion Bombing Officer, Lieut. C A Thomas gave a demonstration of the S.I. or Sticky Grenade. A third demonstration of a Battle Platoon in attack used two Bren Guns firing live rounds over the heads of the attackers. Land mines were also set off in the path of the attackers. Camouflage was worn by the men, who had to carry out the objective of taking a building. Other demonstrations that day included the use of the E Y Rifle that fired live grenades, the Northover Projector and the Browning Machine Gun. An American Colonel was impressed by the use of the Smith Gun under the command of Lieut. Jones, whose marksmanship was 100 per cent. Within a year, the US contingent would have been fighting the real enemy in Europe for four months and would be approaching Belgium, having liberated, along with the British and their other allies, most of France. All training was suspended on the 24th December to allow the Battalion to celebrate Christmas. They would return to duty on the 9th January 1944. Hopes were raised that the war would end in 1944 with the expected invasion of Europe. 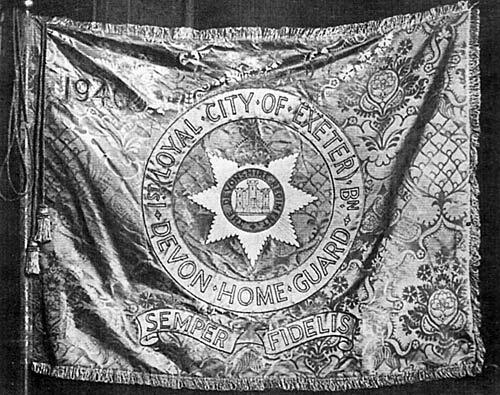 The 1st (Loyal City of Exeter) Battalion, Devon Home Guard flag. 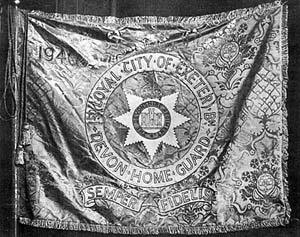 Presenting the 1st (Loyal City of Exeter) Battalion, Devon Home Guard with its flag. Despite the growing realisation that a German invasion was now very unlikely, and if anything, the Germans would have prepare for their own invasion, the 1st Battalion continued their training. Battle Inoculation was arranged for all companies. A couple of platoons at a time were sent to Digby's Quarry where squads were formed and given a patrol to perform during the hours of darkness. The quarry was criss-crossed with trip wires attached to cans and bells, which would make a noise if yanked by the attached wire. If a noise was heard, two Bren Guns would open fire with live ammunition and tracer over the heads of the patrol. In addition, to make the task difficult land mines, thunder flashes and 69 grenades were set off. The patrol had to reach the centre of the quarry, without setting all the above off, and engage the enemy life-size targets with Sten Guns and rifles. One night, Alderman Fred Cottey and Tarr, Town Clerk C J Newman and Lieut. General E A Osborne watched a patrol go through its paces. 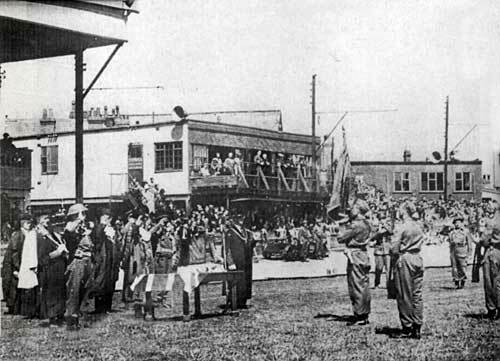 The presence of the US forces preparing for D-day led to the US Army First Aid giving a demonstration to members of the Battalion, in the Drill Hall at Colleton Crescent. The Battalion were also invited to use the Allied Services Club, when in uniform, that had been opened in the Royal Albert Museum. There was more time for socialising during 1944, and as a result, several 'socials' and dances were held at the beginning of the year. At a dinner held in the Officers Mess in February 1944, special care was taken to entertain their wives, as it was felt they had contributed as much towards the success of the Battalion as the men. After the toasts, a speaker asked an N.C.O. what action he should have taken during a particular exercise – the N.C.O. replied that he had thought about making himself a cup of tea. Another tale told was of the old Sergeant-Major, who, proudly wearing his South African War Medals, when enrolling in 1940, stated his age as 45. The 14th May 1944 was the fourth anniversary of the founding of the Battalion, and the Express and Echo published a tribute article. A parade took place in which the Flag was paraded, headed by the band of the Devonshire Regiment. The Battalion then paraded in the Bishops Palace gardens, the first timethat an armed force had ever been allowed. Gaumont News filmed the days events, and again, the cinema audience eagerly watched their citizens army on the screen. A copy of this film was also presented to the Commanding Officer. At the end of April a special operation was carried out and all vulnerable points around the city manned, as the Allied Forces prepared for embarkation for Normandy. The operation was stood down on the 1st July, as the beach head in Normandy was firmly established. The Secretary of State for War announced on 6th September that compulsory training and drill for the Home Guard was to be discontinued, and that all operational duties were to be on a volunteer basis. 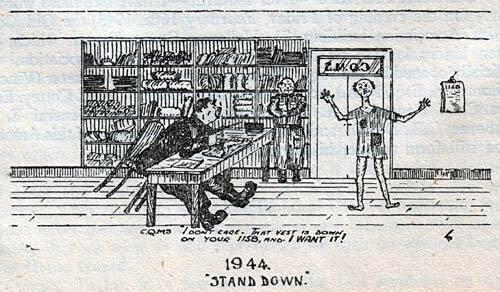 A pamphlet was issued entitled "Instructions for the Standing Down of the Home Guard" and preparations were made for the final 'Stand Down'. On 27th October, orders were issued for 'Stand Down' and were to be completed by 31st December. The 3rd December was the Battalion's final parade from Pinhoe Road, along Sidwell Street, the High Street, Fore Street and Cowick Street to the County Ground. There was then a march past the Mayor for the final salute and a message from the King was read. Certificates of Service were presented to the relatives of those men killed during service with the Battalion, and the National Anthem played – and what has since been affectionately termed, Dad's Army fell out for the last time. We may laugh at some of the antics of the Home Guard, from the complacency of the 21st Century, but when Britain needed them, men of all ages stepped forward to defend their country – Captain Mainwaring, Pte. Pike, Cpl. Jones and Sgt. Wilson may be fictional, but their real life counterparts would have given their lives for their country. Source: "Ever Faithful" 1st (Loyal City of Exeter Battalion Devon Home Guard 1940-1945 by Lt Col H J Wiltsher OBE, Exeter Burning by Peter Thomas and Wikipedia. Stand Down - a good job done.